Housed in the historic Salem Savings Bank building, Ledger is a restaurant intent on keeping the past alive. With a focus on traditional 19th century dining and drinking, Ledger presents historic techniques with modern elegance in a warm, convivial atmosphere in the heart of downtown Salem. The historical elements at Ledger come mostly in the form of ingredients and preparation—at first glance, it doesn’t look like people were eating all that differently 200 years ago than they do at New American restaurants today. 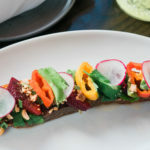 Meat, fish, and produce hail from local farms and purveyors, and the menu is divided into mostly familiar categories, with small plates, raw offerings, large plates, and charcuterie. The “Supper” section is an old-timey addition, with shareable options that feed two to three. One feature of the large open kitchen is a large wood-fired grill, which chars its rustic charm into many of the menu items. Just like the food, the drinks at Ledger strike a balance between past and present. Cocktails feature ingredients that might have been seen in a Salem pub of old, with rums, sherries, and house-made shrubs presented in intriguing ways. The beer selection is worldly, with a variety of styles, and ciders are well-represented. The wine list might be anachronistic, but features a well-curated selection of glass pours, half bottles, bottles, and magnums from around the globe, divided by flavor profiles rather than varietal. Lofty ceilings, immense windows, and the broad, open kitchen give a sense of shared space and conviviality. The four-sided bar is the most prominent feature in the room and gives a communal, knights-of-the-round-table feel, with high-backed barstools and a gorgeous chandelier suspended from the intricately patterned ceiling. Exposed wood beams and the bank’s old brick walls make the space feel warm and casual. The restaurant features a private dining room with its own bar and seating for 65 guests or standing room for 80. Michelle Boland, Pastry Chef at Ledger in Salem, was first introduced to the pastry world at Johnson & Wales University, in Providence, Rhode Island, where she earned a degree in Applied Science in Baking & Pastry Arts. While attending J&W, she was taught everything from basic desserts, sugar sculpting and chocolate, to breads, French pastries and buffets. When Boland isn’t in the kitchen creating innovative indulgences for guests she can be found sculpting, drawing or binge watching her favorite shows on Netflix.